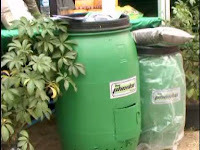 Biophosko® Composter Bin ( Size Type M) with dimension ( Height= 80 cm, Diameter= 40 cm) a drum made of plastics is the right solutions to handle trash (especially for organic trash from households remnants such as : food, paper, etc). Transform the households trash into something useful like compost which is benefit to preserve the fertile of the soil and also as the nutrients supplier for your plants. Changing waste into something useful - namely compost - is useful in maintaining soil fertility and the supply of nutrients for your plants. Composter input capacity (M) at 0.08 m3 (80 liters) of waste or the equivalent weight of 20 to 30 kg with an output of 120 liters, will be able to process waste from approximately 5-6 days garbage - produced by a household. Known to every soul issued approximately 2.6 liters (1 kilogram) of trash per day or 15 liters per family with five people. Suitable and can be used for treatment of minor household waste. 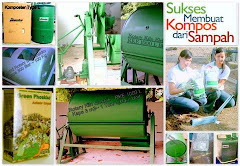 This composter is capable of providing sufficient aeration for the workings of the bacteria in the activator Green Phoskko, PH ensure stability, keep the temperature at mesophilic conditions (30-50 degrees C), keep the humidity at 40-60% moisture content.